Contemporary low voltage switchgears are subject to more and more strict legal restraints e. g. regarding heat dissipation, high packing densitiy, short circuit resistance and insulating capacity. These quality specifications are documented in increasingly tightening legal regulations and standards of the VDE, IEC and ZVEI. Only type-tested switchgears currently meet these high demands. Our view is especially focussed on IEC 61439-1 and -2, DIN EN 60439-1 (VDE 0660 part 500). The TRIPS product development team has transformed the challengeing market and legal parameters into the innovative low voltage switchgear concept TRIMOT. 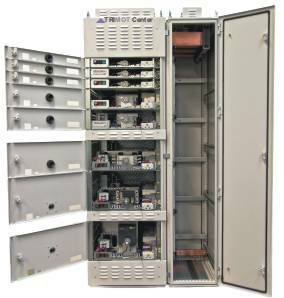 The variable MCC outgoing feeder units are integrated into Rittal Ri4Power Systems. They meet highest requirements regarding personnel security, variability and switchgear availability. The TRIMOT withdrawable units are applicable as motor outgoing feeders up to 160 kW or rather load outlets up to 630 A. They allow a high packing density up to 22 withdrawable units à 75 mm. The modules are freely configurable in the cabinet and ensure a flexible modulation of the electrical concept. Consistent operating interfaces and internal assembly permit a quick familiarisation. circuits with and without communication connection. 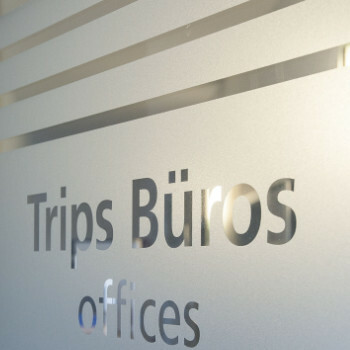 The distinctive feature of the TIRPS technologie becomes obvious in the construction of the contacting between the withdrawable unit and the cubicle bar. This patented system is designed safe against arc faults. Energy and data are transferred via a switchable contacting module between the withdrawable unit and the function board in the side panel. The cubicle bars are completely insulated. Live links between the withdrawable unit and the busbar are hermetically capsuled until the first connection with a control unit. In case of a short circuit the electrodynamic force increases the pressure between the contacts and prevents arc faults. Thus they are arc fault safe. Single modules are safely changeable – even under electrical voltage. A mechanically locked protection against operator mistakes as well as an operating, test and disconnected position ensure an utmost protection of persons and machines at a maximum availability of the switchgear. Furthermore the assembly of the contacting modules at the side panel only demands very little space of the 600 mm deep switch cabinets with a rated current up to 3.600 A. For the needs of small drives TRIPS provides for the TRIMOT Motor Control Center especially designed miniature withdrawable units. This cost-saving alternative up to 7,5 kW (3 kW for motor starter SIRIUS 3RM1) needs less space than conventional withdrawable units. It is – as our TRIMOT-Solution using standard-modules – arc fault free. You’ll find further information in our flyer TRMOT Center Miniature Withdrawable Units. Here you’ll find an overview of the technical data of our entire TRIMOT-Solution. The detailed product brochure is available here.